Before you start reading, are you looking for our full review of how to get from Bangkok to Siem Reap? If not, carry on. If you’re heading from Thailand to Cambodia, the Bangkok to Siem Reap direct bus is the easiest way to do the trip overland. Why might you want to go overland, one might ask? For one, it’s a lot less expensive, with the direct bus costing between $28 and $35. For another, if you’re looking to transport large or bulky household goods or have large pieces of luggage, the direct bus is an easier option, particularly because they don’t make you change buses at the border. There are now two companies running direct buses between Bangkok and Siem Reap, Nattakan and Giant Ibis. We have more in-depth reviews of both Nattakan (see below) and Giant Ibis (click here) on this route if you want to get into the nitty-gritty details, but in summary, I have taken both several times and think that Giant Ibis offers a better trip. 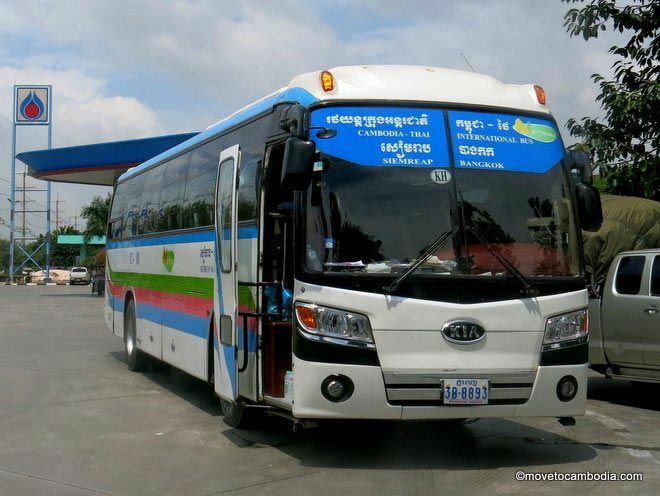 They leave from a more convenient location near Khao San Road, the buses are brand new and the entire journey, including the border crossing, is smooth. Although the ticket is more expensive at $35, it’s well worth the price. If you’re going with Giant Ibis, tickets can be bought online and a seat reserved in advance for $35 with no additional service fees. You can print your ticket out or just show it to them on your phone or device and you’ll get straight onto the bus. Buying online allows you to choose your own seat, and advance purchase is recommended because the bus can get busy in high season. You can also buy Nattakan tickets between Bangkok and Siem Reap (plus Bangkok and Phnom Penh) on BookMeBus. Tickets cost $28 in either direction, plus a 5% booking fee ($1.40 per ticket). The procedure is simple and you’ll receive an e-ticket that you can either print out or present on your phone when you arrive at the bus station. In high season the buses are often full, so it’s more than worth the booking fee to be able to reserve a seat in advance. Tickets for Nattakan can also be purchased at the Northern bus terminal in Bangkok, sometimes called Mo Chit 2 bus terminal, sometimes called Chatuchak bus terminal. On the ground floor a booth labeled The Transport Co, Ltd. sells the Bangkok to Siem Reap tickets. Taxi fare to the bus station is around 150 baht (about $4.25) from Sukhumvit, making the trip a more expensive way to get a ticket than the online option unless you’re already in the area. The Nattakan buses run at 8 a.m. and 9 a.m. in either direction and the Giant Ibis leaves at 7:45 a.m. The direct bus from Bangkok to Siem Reap takes between 8 and 11 hours, depending on how crowded it is at the border. Passengers are allowed two bags each with a maximum weight of 20 kg, although the weight limit was not enforced when I hauled two suitcases of Ikea merchandise to Cambodia. There is limited storage space above the seats in the bus, so if you want to stow something inside, board early. The Nattakan Bangkok-Siem Reap direct buses are Korean, and seats are comfortable and lean back more than they probably should–watch out for the knees of the person behind you! On my recent trip, the 9:00 a.m. bus from Bangkok left on time. We were given a bottle of water and a snack, which was a limp-looking Asian pastry. There was a toilet break at 11:00 a.m. at a rest stop with a giant 7-11 and some fast food and local food options. At 1:10 p.m. we stopped at the Transport Co., Ltd. office in Aranyaprathet and were each given a ready-made hot lunch from 7-11, in my case it was shrimp and basil stir-fry. I’m ashamed to admit, but I thought it was pretty good if a bit on the small side. Vegetarians be warned, you’ll need to bring your own lunch. Later, we were given the choice of an orange juice or an iced coffee. You won’t starve if you don’t, but it’s definitely worth bringing some food of your own on the trip. By 1:40 p.m. we were at the border, and everyone had finished their visa process and we were on the road at 3:15 p.m. We arrived in Siem Reap at 5:30 p.m., for a total of 8.5 hours. When you approach the Poipet/Aranyaprathet border, the bus will stop and let off all passengers. You can leave your bags on the bus (that’s why they call it a direct bus, there are no bus changes). You’ll then be expected to walk yourself through the various border checkpoints. There’s not a lot of instruction from the crew and the process can be confusing for those who have not done it before, but it’s actually quite simple. Just remember that you need to be stamped out of the country you came from and get a visa for the country you are entering (so two stops). If you are heading from Bangkok to Siem Reap, after you go through both offices, turn back around and the bus will be waiting for you in front of the Grand Diamond Casino. They wait there for every passenger to complete their visa process, which takes an hour or two in total, so don’t be afraid to go into the casino and have a drink or a meal in the Chillax Cafe. It sounds awful, but the food isn’t too bad. Most nationalities do not need to get visas in advance (check out our page about Cambodia visas if you want to know more). On the Cambodia side, a tourist visa costs $30. The bus company will request an additional $5 to have your visa batch processed with everyone else on the bus, and it is much quicker. Some days the bus company will require you to do this, other times you can secure your visa on your own. If you choose to do it on your own, the visa officials will ask you for 1100 or 1200 baht (~$35) or if you insist on paying in dollars, which you should, they will ask for $30 and a 200 baht processing fee. There is no processing fee, it’s just a bribe. Arrive early and refuse to pay and eventually they will stamp you through. Telling other passengers the real price loudly will usually get you serviced more quickly, as they will be eager to get you out of there. The other option is to secure an e-visa in advance. The price these days is $40, so you won’t save any money doing it that way, although it may help minimize border-induced rage that is not uncommon in Poipet. For more about crossing the Poipet border, check out our post on Crossing the Poipet/Aranyaprathet border overland. This is the official building that you get your Cambodia visa in. If you stop somewhere before the border, don’t bother wasting your money. We’ve gotten reports that the bus will stop before you get to the border and try and get you to use an agent to process your visa for 900 baht by calling it a VIP service. They did not do this on my recent trip, so hopefully this is no longer an issue. However, if they do stop and try and get you to let them process your visa you have a choice of whether or not you pay. However, this so-called VIP service can be worth it, and it’s often faster and less stressful to just pay the extra money, so it’s up to you whether or not you think it’s a battle worth fighting. On the Thai side, you will get stamped through and do not need to pay anything. Overall, this is a much easier way to travel overland than the other methods I have tried, which always involve haggling at the border for taxis and buses. The Bangkok-Siem Reap direct bus is not as cheap as the mini-bus/casino bus combination (which is usually around $11 or $12) but the peace of mind is worth it. If you’re looking for more info on going the other way, check out our post on getting from Siem Reap to Bangkok. This entry was posted in Transportation, Siem Reap and tagged Nattakan Transport, Transport Co. Ltd, Bangkok to Siem Reap, Siem Reap to Bangkok, BookMeBus. Bookmark the permalink. I’m trying to move my Phnom Penh apartment belongings in to storage in Bangkok. A few of these bus trips is looking like the best option. But are there others? Commandeering a taxi minivan for the trip? Will I need to deal with border officials rummaging through my household goods and attempting to extract customs charges? I have only taken a lot of stuff going the other direction, so I am not sure. You might ask the bus company first, because I am not sure if they would let you bring too much stuff. I would probably go with a taxi. 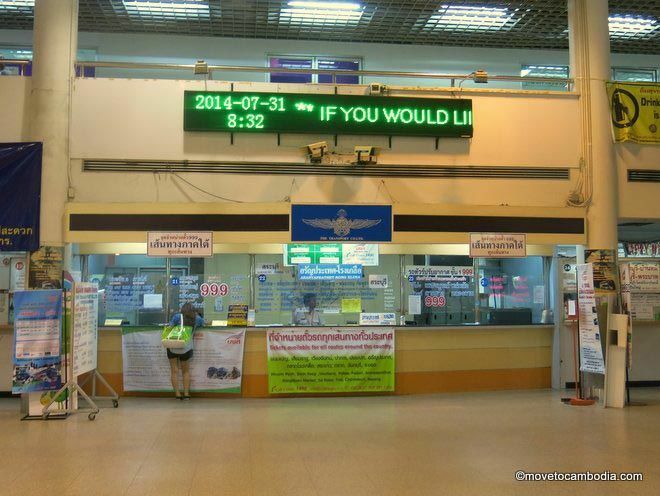 Ask on the ThaiVisa boards, they might have a better idea. Yes, I was going to check with the bus company. The advantage in the bus was, as you mentioned above, it is “direct”. This seems to imply you don’t take your baggage out – or did I get that the wrong way? Anyway, I’ve enquired on ThaiVisa and will do a dummy run with less luggage initially to scope out the procedures. Fingers crossed – the formal shipping costs from PP to BKK are insane otherwise! That’s correct, I am just not sure if the bus company will let you bring a lot, and if you do bring a lot, if there may be a customs issue. Have you talked to Kerry Express? I think they do PP-BKK shipping. can anyone please let me know if the bus has a bathroom? Thank you for this article. I followed along on my trip and everything was pretty much what you said. We had someone get on asking to do the visas for 1400thb,only a few people said ok, most went ahead and did it themselves. Using your pictures I was easily able to find exactly where I needed to go. For the visa they were asking 30usd + 100thb service fee. For that small amount I didn’t want to put up a fuss and just paid. Was a really quick process. Again, Thank you so much for this article, it was perfect. I prefer Tuk uk. I have a great driver. Have used him in all the times I have been to Siem Reap. Go slow, enjoy the scenery, and, get some breeze in your face :-) Often, the good tuk tuk drivers can give some advise . I did a variety of journeys via bus, Ho Chi Minh to Dalat, Pleiku to Banlung, Banlung to Phnom Penn, Phnom Penn to Siem Reap, Siem Reap to Bangkok, Chiang Mai to Vang Vieng, Vang Vieng to Vientiane, Vientiane to Hanoi. In all instances my hostels were selling tickets, sometimes I went to local travel agents because they can be cheaper. Sometimes (actually fairly often) I would book tickets at the last minute. Outside of holiday season, I never seemed to have an issue with booking at the last minute. If your goal is to just get from A to B, of course you can buy tickets at hostels and local travel agents. If you want a specific bus, though, it’s best to buy tickets in advance. 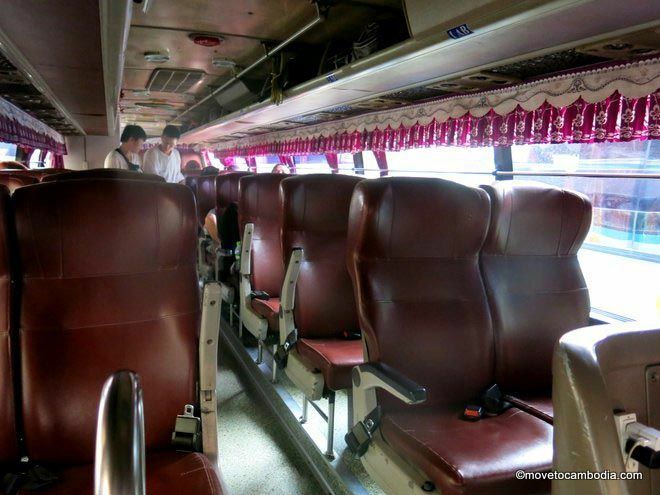 The only actual direct buses between Bangkok and Siem Reap are often sold out so if you don’t want to end up taking several minibuses, it’s best to book in advance. Can anyone from ASEAN countries explain how will be the process if we get to the border. Do we need to pay for the visa and/or entrance/exit fees? I am from the Philippines and I need some clarifications about this. Thanks! I have asked the same question to Thai consulate in India. They said they will have to forward to Thai officials coz no body knew exactly at visa processing centre . Also they wanted the confirmed bus tickets to forward my letter. So probably I might be knowing in a week time depending on when I submit my itenary to them. Looks like I am the first Indian to cross border by road :) what I have read in trip advisor is that we can get re entry at airport might be 1000 or 1200 bhat. But not sure whats the status now and also depends from country to country. Im malaysian. And i went to cambodia from bangkok by bus. Agreed with all point above. Tq for sharing this because it help me. For visa, the cost is $30 but i dont have to get a visa because im malaysian. There 3 nationality that doesnt have to get a visa means dont have to pay the visa ehich are malaysian,singaporean and philipines if im not mistaken. You can double check it at Cambodia embassy website. 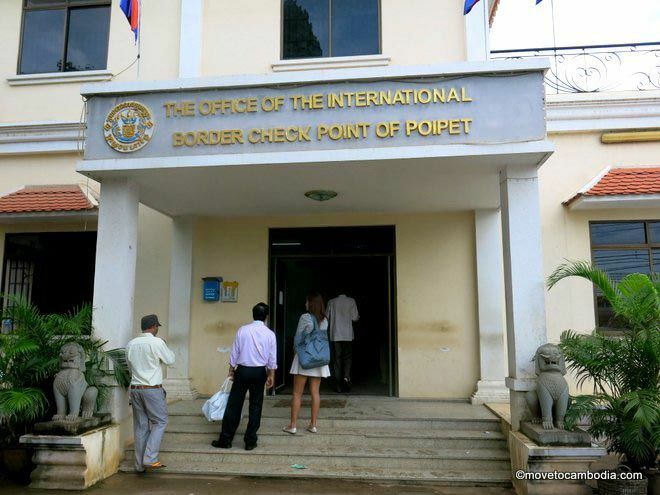 Do all nationals needs a visa to enter Cambodia? Hi all. I have successfully completed my Cambodia trip after asking so many questions in this forum and there were no answers as my country requires visa and many people were from West who don’t require visa. It was an extraordinary experience to cross border on road. This experience I am sharing is for people who are from countries who require visa to enter Cambodia and back to Bangkok by road . As soon as I landed in Don meuang airport I went to immigration officer and explained them about my trip. I said them that I would be staying only for a day in Bangkok and will be going to Cambodia the next day so I require a re entry since my return to homeland is from Bangkok . Immigration authorities were extremely helpful made couple of calls and then they have confirmed that I can get a re entry at aryanaprahat border. Since my return is also by road they said it’s not possible to give Re-entry at airport. As soon as I reached border had to fill a form pay 1000 bhat and got my Re-entry stamped. I am sorry to say but siem reap is an incredible place with scams all over surrounding you. Scams starts right when you enter PoiPet from immigration officers. It was unbelievable. To stamp visa they ask money, to stamp your arrival details in passport they ask money. That was crazy. Thanks to many people across globe who gave me tips how to avoid scams without whom trip would have been scary. Being a tourist spot even to piss you will have to pay 1$. There is no value for money at siem reap so plan your trip accordingly. Inspite of all scams omg the temples has blown me away. It’s unimaginable how this huge temples were constructed 1000 of yrs before. It’s a must place to see. I stayed for 2 days and lost 1 day since I missed my bus at Bangkok due to bad traffic. 2 days is short but I am happy to say that I have covered all temples if not most at a radius of 60 km which even is out of tourists knowledge. I wanted to see few places which were out of map. So don’t be too much scared just enjoy the experience. As always if you guys want to know anything let me know. Have a great trip. How can you say that you covered most temples in 2 days in a radius of 60 km. Did you get to Banteay Srei, or Beng Mealea. What were you in ? A race car. Go slow, and enjoy the experience. I’m going back February 2019as well. It’s all about planning. If you take a tuk tuk for sure you would not cover anything :) I hired a car started early and covered most of important temples including kbal spean which is out of any tour operators map and requires a solid 4 to 5 hours since you will have to trek up the hill which has no proper path way. I do agree and recommend to stay longer but if motive is only temples then 3 days is more than enough for sure. Regarding scam it depends. I have observed that if you are youngster them ask money but if you are senior by age in most cases they don’t. It all depends on person. But the truth is if you stamp visa on arrival then for sure they are going to ask money from all. Can you let me know what all temples, places you visited near Siem Reap (other then main temple)? Is there any map / link that you can share which will help me in planning my trip (in Dec 2017). I am also planning to take a road trip from Bangkok to Siem reap. Do you have any specific visa related suggestion/advice for me..? Thanks in advance. Here is the link to apply for the Cambodia e-Visa. You will need a digital copy of a passport photo. The application form is straight forward, and, when I went to Cambodia early this year, I had the visa in 15 minutes. It normally takes a day, but, I must have caught them at a quiet time. I have been to Cambodia about 4 or 5 times now. My first trip was 3 days, and, I really saw nothing. A week is the best option. Plenty of hotels from $10 to $1,000. The cheap ones are a bit so, so. I would budget on around $40 ~ a day to get a reasonable place. Temples. Of course, you will see Angkor Wat, The Bayon, Banteay Srei, Ta Prohm ( just be prepared for all the tourists wanting their photo taken at the Angelina Jolie door :-) Bakong, Angkor Thom, Thommanon, Hall of the Leper King, All the Gates * North, South, East & West. I even did a tuk tuk trip to Beng Mealea. It was a long day, but, I saw some great scenery. I did that particular trip in September 2011, so, all the fields were very green. Road trip from Bangkok. That’s how I get there. Take the bus from the Northern Bus depot in Bangkok. It was a bit different from my previous trips, in that I was on the same bus all the way. When you get to the border, you have to be stamped out of Thailand, and then, into Cambodia. They have built a new visa processing facility there. Just follow the people is my advise. Hi Kiran.. This article explains everything.. My advice would be instead of booking through bookmebus, if you are at Bangkok even a day or 2 before you can go and book tickets at counter from mo chit 2 bus terminal for 750bhat. In siem reap you will have to take pass for visiting temples. I took a 3 day pass for US$62 which has been increased recently . you have like small and big tour.. Small tour covers angkor wat, angor Thom and others and big tour covers distance of 50km.. For small tour you can hire a tuk tuk which might cost you $20 including morning sunrise at angkor wat.. I hired a car for $45 for long tour and I visited kbal spean which is 5 to 10km extra to long tour . I covered all the temples in 2 days.. You have lots of travels near pub street with whom you should negotiate and get the best deal.you also have buses to Bangkok. if you are flying back to your home country from bangkok don’t forget to get re entry stamping at Thailand border at cost of 1000bhat. And for Cambodia you can get visa at border for cost of $30. They will ask bribe everywhere at immigration. Do not panic. You can tell them that visa cost is only $30 and they will ask you to go . even at immigration they might ask you money. Just ignore it for some time, they will give back your passport.